Shift 2 Bikes is a loose knit community of Portland bike-riders who pick days out of the month to take bike rides touring different events and interests around the city. One Sarah Mirk had decided to organize a “Comic Book Bike Ride” for the month of June, which the IPRC was involved in. The agenda was touring four different comic shops (staring at Reading Frenzy), do various illustrations and short comics along the way for prizes, and then publish our zine at the IPRC before retiring for beer and “Spiderman” cartoons at Sarah’s house. 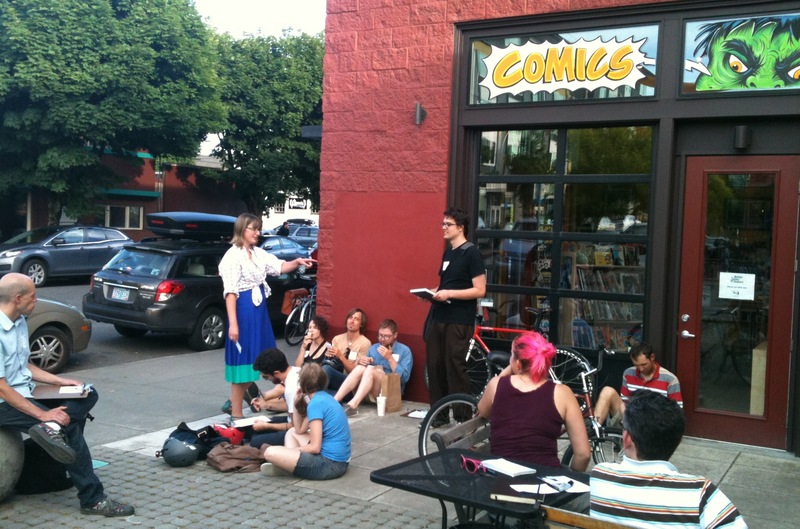 Beer, comics, AND bike riding? I knew I came to the right place. This is the most low key “How Do We Kill Superman” meeting I’ve ever been to.